February 2011 Map. Click to enlarge. 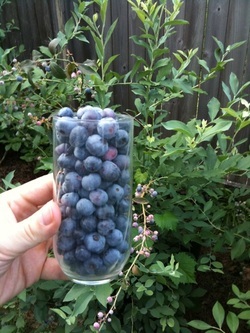 If I could, I would tear out every last blade of grass and only have fruit trees and vegetable beds. However, in order to stay happily married, I have to limit my fruit tree madness to the borders of the yard and leave some open space so the children have a place to play, etc. 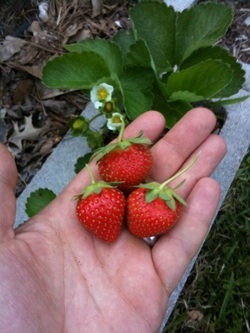 It is my mission to grow as as much fruit as possible on my 0.2-acre suburban lot, so that my kids can go outside and pick a snack year-round. 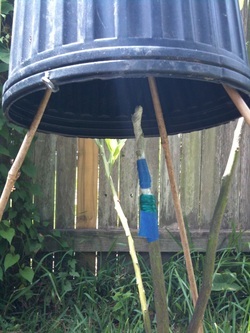 I have planted somewhere around 50 fruiting trees and bushes representing approximately 100 cultivars, with fruits ranging from the common to the unusual. It will probably take 5 years or so to bring everything into full production, but it will be worth the wait. As I go, I'm going to try to develop a fruit calendar specifically for my area in northwest Houston, and keep detailed notes on which varieties perform the best. Any varieties I don't already have. 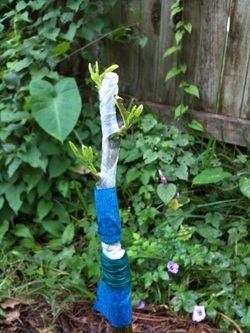 If you're going to grow citrus in northwest Houston, it is very important to only buy trees grafted to trifoliate rootstock (Poncirus trifoliata). 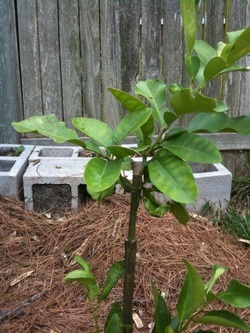 Though not a true citrus itself, trifoliate is closely related, and is graft-compatible with almost all citrus. It is the only 'citrus' that loses its leaves in the winter, and gives a good bit of cold hardiness to whatever scion is grafted onto it. 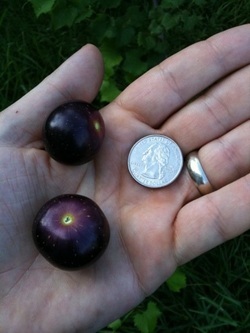 It also produces a semi-dwarf tree, which is easier to protect from freezing temperatures, and keeps fruit at an easy-to-pick height. It can easily be recognized because as its name suggests, it has leaves in groups of three.There's also a variant called 'Flying Dragon' that is more dwarfing and has curved thorns. Most nurseries don't label or don't know what rootstock is used, so it can be difficult to get the right thing. Both the Arbor Gate and RCW Nursery carry good selections of citrus trees grafted on trifoliate and Flying Dragon rootstock. RCW can show you what it looks like if you're interested. Check the tags and see where the tree was produced. Treesearch Farms grafts onto trifoliate. I was told at one point that Brazos Citrus Nursery grafted their stock onto trifoliate, but now it seems as though they graft citrus labeled "Dwarf" onto flying dragon, kumquats onto Volkamer lemon rootstock, and other citrus onto Carrizo citrange (orange-trifoliate hybrid). Saxon Becnel & Sons trees are grafted onto Carrizo citrange. Other good source of citrus trees on the right rootstock include Mr. Texas in Beaumont, and John Panzarella in Lake Jackson.Mr. 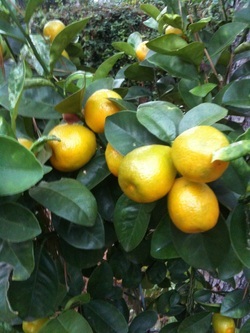 Texas t-buds citrus on flying dragon rootstock, and Mr. Panzarella cleft grafts his onto wild poncirus trifoliata rootstock. Both will sell you rootstocks if you want to learn to graft yourself, and they will have citrus varieties you won't be able to find in most nurseries. 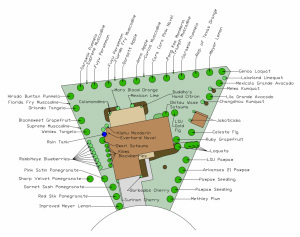 You can see wild trifoliate and collect fruit and seeds in the fall at the Armand Bayou Nature Center. Most nurseries like sour orange rootstock because it is cheaper, and it grows faster, and therefore looks bigger and nicer to the uniformed buyer. Most of these trees are shipped up from the Rio Grande valley, and they can have a hard time coping with our arctic cold snaps and gumbo clay soils. 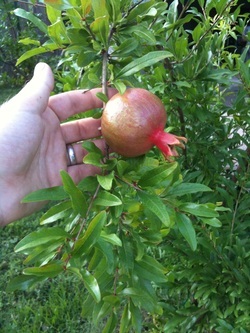 Don't buy trees from Walmart, Home Depot, Lowe's, or Houston Garden Center if you want them to survive long enough to produce fruit. The primary objective of the big box stores is to sell sell sell, they're not interested in the long term health of your trees. It is much better to find a good knowledgeable, local nursery. You really do get what you pay for, and it's definitely worth the extra $10 to get the best trees produced specifically for our area. Most people think that grafting as a difficult and mysterious craft, not attainable by the average person. Wrong. Grafting is easily learned, and like everything else worth doing, all it takes is practice. When you're learning like I am, some of your grafts will fail, but don't get discouraged. Just try again, and every time you try you'll get better. My hope is to eventually graft several varieties onto my trees in order to get lots of different cultivars of fruits over an extended season. I prefer the cleft graft, because you don't have to wait until the bark is slipping like you do with t-budding and bark inlay grafting. 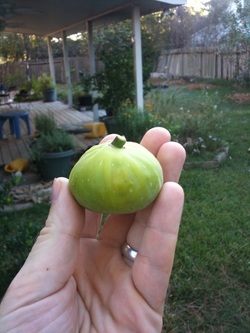 I've tried t-budding a few times with limited success, but so far I have had nearly 100% success with cleft grafting. 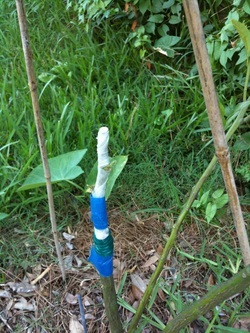 I've even had good success with cleft grafting in the middle of the hottest driest Houston summer on record. A&M's instructional guidance on cleft grafting can be found here, and guidance on t-budding can be found here. I've also recently learned bark grafting, which is very useful when you're trying to graft a small budstick on to a large branch. A great photo tutorial by Joe Real can be found here. 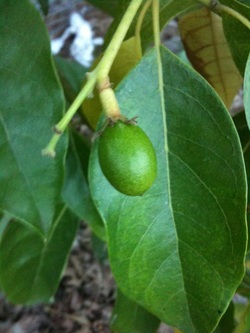 Cleft graft of Sarawak Pummelo onto a Pong Koa mandarin. Success! New growth from the scion. 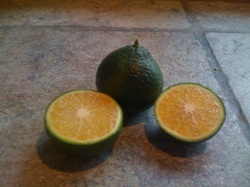 I think it would be really fun to breed my own variety of citrus (and name it after Dr. Wife). I first started thinking about it when John Panzarella told me about his attempt to breed a pink lemonade fruit by crossing an Ujukitsu with a Ruby Red grapefruit. It didn't work out for him, but it got me thinking. 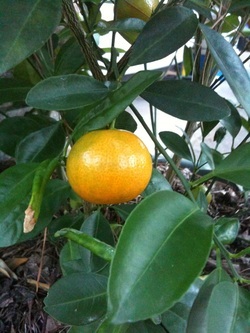 I wondered if I could breed a red kumquat by crossing a Changshou kumquat with a Moro blood orange. It turns out that's not possible either, but I still want to breed my own variety. My general plan is to attempt one cross every year, and see what I get. I'm not sure what my first attempt will be, but being married to a geneticist, I'm sure we'll come up with something interesting. Email me if you have an idea for an interesting hybrid.